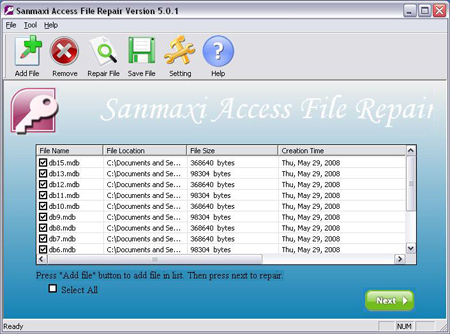 MS access files repair software or MDB repair tool is a access repair utility scan the corrupt mdb or damaged access database files and repairs the data. Access database repair software support Microsoft Access 97, 2000, XP, 2003. Software can easily restore corrupt or damages .mdb file which is not open and corrupted due to virus attacks, accidental shutdown. MS Access database repair software support all Microsoft Windows operating System. ...... MS Access database repair software support all Microsoft Windows operating System like Windows 95, Windows 97, Windows 2000, Windows 2002 and Windows XP and home users, database administrators, computer professionals easily repair corrupt access database (.mdb) files. * Access restores corrupt access database mdb files which fail to open due to sudden system shutdown, virus attacks or due to any other reasons. * Access database repair program repairs password protected MDB Databases files if the password is known to the users. * Access database repair program support all versions of Microsoft Access like Access 95, 97, 2000, 2002 and XP. User can free download and try it. Access database repair software repairs damaged corrupted MS access databases. Qweas is providing links to Advanced Access Repair Program 5.0.1 as a courtesy, and makes no representations regarding Advanced Access Repair Program or any other applications or any information related thereto. Any questions, complaints or claims regarding this application Advanced Access Repair Program 5.0.1 must be directed to the appropriate software vendor. You may click the publisher link of Advanced Access Repair Program on the top of this page to get more details about the vendor.